Welcome to the Field Your 'High Point Rockers'! (High Point, N.C., July 12, 2018) – It started in May when the ‘Name Your Team’ Contest began. With more than 2,800 suggestions, it was whittled down to nine and then to one via fan voting. On Thursday night, in front of over 1,000 fans, the ‘High Point Rockers’ were officially unveiled, along with their logos, at the site of BB&T Point. The Rockers will begin play in the Atlantic League of Professional Baseball in the spring of 2019. The name ‘Rockers’ was the winning vote of a months long campaign, beating out eight others, including Dragon Claws and Splinters in the final total. The announcement came as part of the most recent BB&T Point Progress Party where fans also toured the construction site. An ode to the furniture manufacturing past that made the City of High Point what it is today, the Rockers name and colors also embody the rock ‘n roll energy the downtown revitalization will provide. There were originally a total of 64 individual submissions of the name “Rockers” during the ‘Name Your Team’ Contest from across the state. In the end, Elizabeth Briggs of High Point was selected as the grand prize winner for her submission. As the winner, Elizabeth will receive two season tickets for the inaugural year, a personalized home jersey, and the opportunity to throw out a first pitch at a 2019 home game. Also revealed to the crowd were four logos, seen below, that now appear on caps, t-shirts, and other merchandise; some of which was available for purchase at the event. The primary logo features a rocking chair with baseball rockers, hand grips made of baseballs, and a flame that will help rocket the team, and the City of High Point, in to the future. Each logo includes four main colors visible in each design. Ball Point Blue, High in the Sky Orange, Rocket Chair Red, and Summertime Yellow all pay homage to the city, name, region, and season of the new team. The Primary Logo (logo A) will be seen in many pieces of marketing material and merchandise in the future. It prominently displays the home city, High Point, in cursive writing, at the top with a “rocket chair” blasting through a dark blue background, which includes five stars twinkling throughout. On the back of the chair, the initials “NC” are seen in home plate, recognizing the state of North Carolina. A secondary, standalone version of this logo (logo C) does not have the city name at the top, but rather the initials “HP” on the back of the chair. It also does not feature the dark blue background, highlighting the “rocket chair”. Other logos debuted include an alternate version with only the “HP” initials and a baseball shooting underneath (logo B). 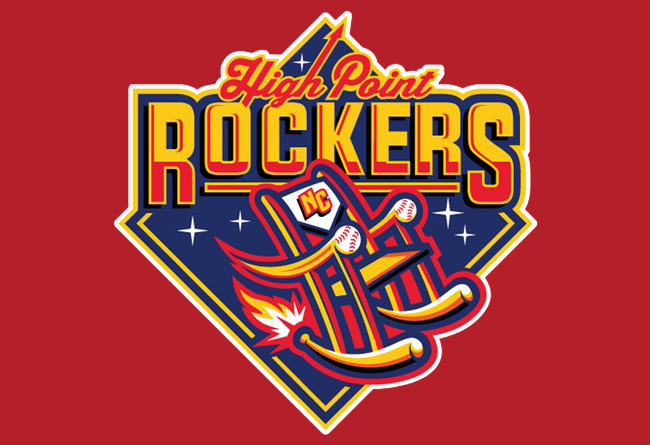 Finally, the team’s primary word mark (logo D) sees “High Point Rockers Baseball” stretching across a dark blue background, as if sprawling out over a baseball diamond. It also includes the arrow from the primary logo pointing upwards, the direction of the city’s downtown. Along with seeing the name and logos for the first time, fans were able to cap off the historic day by purchasing the first official hats, shirts, and other team merchandise. Adding to the excitement, many in attendance reserved their seats to cheer on the Rockers by placing a deposit on 2019 Season Tickets and Club Memberships. Deposits will continue to be accepted online at www.highpointbaseball.com with deposits for season tickets costing $50 and Club Membership deposits costing $250. Fans will be able to choose their individual seat location based upon when they make their deposits. Each BB&T Point Progress Party will have a theme, as well as a tour to a specific spot on the construction site. This particular tour led fans to a future first row of seats next to the dugout. The additional dates for the BB&T Point Progress Parties are August 2nd, September 6th and October 4th. The themes and tour destinations for those BB&T Point Progress Parties will be announced closer to each party date. For ongoing updates and more information, please slide to HighPointBaseball.com or visit Facebook at @HighPointBaseball, Instagram at @HighPointProBaseball, and Twitter at @HPproBaseball. High Point Baseball will begin their inaugural season in the Atlantic League in 2019 in a brand new approximately $36M downtown ballpark named BB&T Point. Expected to enhance the rich baseball history in North Carolina, High Point Baseball is part of the fastest growing family sport in America. High Point Baseball is committed to providing superior customer service and quality, affordable family entertainment experiences for the Triad of North Carolina. Look for exciting upcoming announcements regarding the name of the team, logos and mascot. In addition, information on tickets and corporate partnerships will also be forthcoming. The Atlantic League has been a leader in professional baseball and a gateway to Major League Baseball since 1998. Over 38 million fans have attended Atlantic League games and more than 900 players and 50 managers and coaches have joined MLB organizations directly from the ALPB. The Atlantic League emphasizes winning baseball games, showcasing the talent of top- caliber players and offering affordable family entertainment.